Regression Models for Categorical Dependent Variables Using Stata, 3rd Ed. 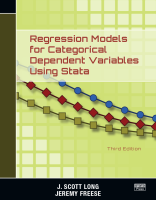 Regression Models for Categorical Dependent Variables Using Stata, Third Edition, by J. Scott Long and Jeremy Freese, is an essential reference for those who use Stata to fit and interpret regression models for categorical data. Although regression models for categorical dependent variables are common, few texts explain how to interpret such models; this text decisively fills the void. The third edition is divided into two parts. Part I begins with an excellent introduction to Stata and follows with general treatments of the estimation, testing, fitting, and interpretation of models for categorical dependent variables. The book is thus accessible to new users of Stata and those who are new to categorical data analysis. Part II is devoted to a comprehensive treatment of estimation and interpretation for binary, ordinal, nominal, and count outcomes. Readers familiar with previous editions will find many changes in the third edition. An entire chapter is now devoted to interpretation of regression models using predictions. This concept is explored in greater depth in Part II. The authors also discuss how many improvements made to Stata in recent years—factor variables, marginal effects with margins, plotting predictions using marginsplot—facilitate analysis of categorical data. The authors advocate a variety of new methods that use predictions to interpret the effect of variables in regression models. Readers will find all discussion of statistical concepts firmly grounded in concrete examples. All the examples, datasets, and author-written commands are available on the authors' website, so readers can easily replicate the examples with Stata. Examples in the new edition also illustrate changes to the authors' popular SPost commands after a recent rewrite inspired by the authors' evolving views on interpretation. Readers will note that SPost now takes full advantage of the power of the margins command and the flexibility of factor-variable notation. Long and Freese also provide a suite of new commands, including mchange, mtable, and mgen. These commands complement margins, aiding model interpretation, hypothesis testing, and model diagnostics. They offer the same syntactical convenience features that users of Stata expect, for example including powers or interactions of covariates in regression models and seamlessly working with complex survey data. The authors also discuss how to use these commands to estimate marginal effects, either averaged over the sample or evaluated at fixed values of the regressors. The third edition of Regression Models for Categorical Dependent Variables Using Stata continues to provide the same high-quality, practical tutorials of previous editions. It also offers significant improvements over previous editions—new content, updated information about Stata, and updates to the authors' own commands. This book should be on the bookshelf of every applied researcher analyzing categorical data and is an invaluable learning resource for students and others who are new to categorical data analysis.